Dice onion, mince garlic, chop herbs. I used basil, rosemary, and thyme because I had them in my fridge, but you could use any herb blend you want. Saute onion in olive oil until it becomes very brown. Stir often, about 10 minutes. Add the garlic and rice. Stir to coat rice in oil and lightly toast, about 2 minutes. Add the veggie stock and stir. Cook until the stock has evaporated a bit. Add in the milk one cup at a time, stirring often, as the rice cooks. 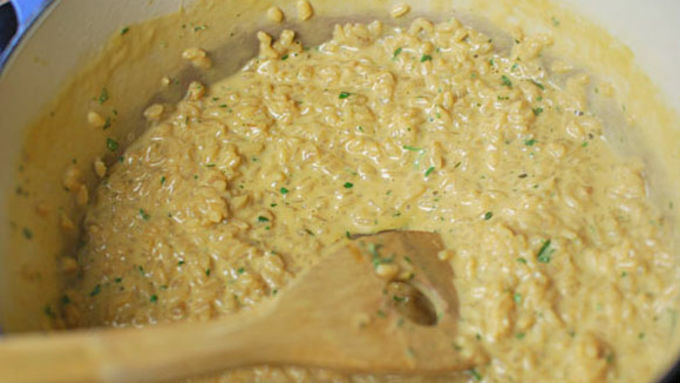 Each time you add the milk, stir and cook the risotto until it has been mostly absorbed and evaporated. This process should take about 25 minutes. 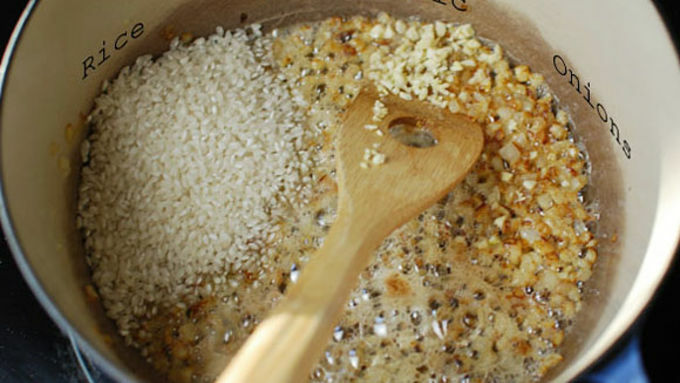 If the rice is not fully cooked when you run out of milk, continue this process using water. Add the herbs and cheese and remove from heat. Stir to melt cheese and mix herbs in well. 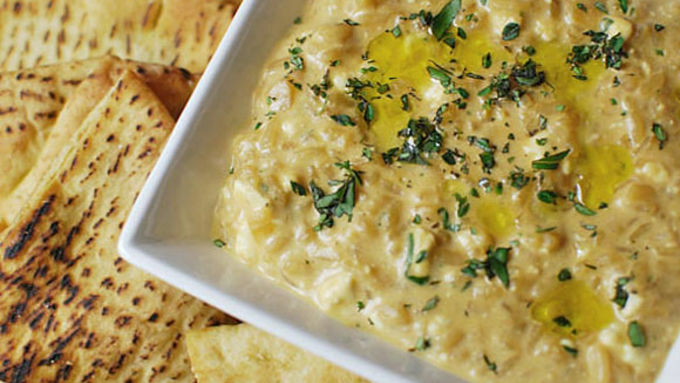 It’s funny how many foods can double as a dip. 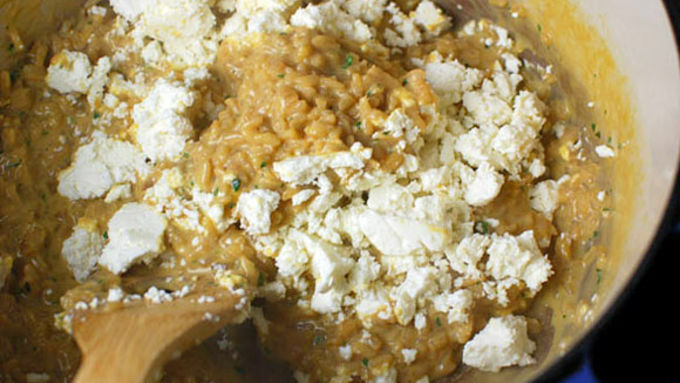 Risotto was something I had never even thought of as a dip until a few weeks ago, when a missing comma in an email turned “risotto, dip” into “risotto dip!” “I’ve never heard of risotto dip but it sounds amazing!” my friend replied. Neither had I. But as you might imagine, it was in fact amazing. 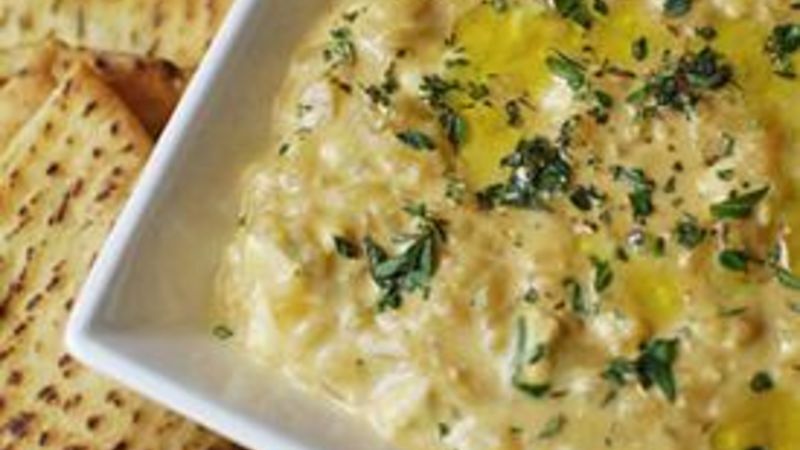 Nice and thick pita chips were the perfect vessel to carry this creamy, cheesy Risotto Feta Dip from the bowl to my watering mouth. To make your own pita chips, just cut pita bread pockets into chip size pieces, toss in oil and salt, and roast at 350 until crisp. Toss them once during roasting to facilitate even cooking. The recipe makes double what you see here, and it is important to have that backup bowl because the first will disappear really quick!